In this special event bus adventure, a sequel to his popular tour about the 1910 Bombing of the Los Angeles Times (see the paper’s feature article about that tour), arson and bomb detective Mike Digby takes us on a scrupulously researched journey through early Los Angeles, exposing a brazen conspiracy to kill, maim or terrorize anyone who stood in the way of a beautiful young woman inheriting the fortune of her estranged husband. While following the forensic leads of the unfolding case on a route rich in time capsule crime scenes, Mike will compare and contrast the historical investigation to the modern crime analysis methods he has used in his law enforcement career. ABOUT THE CRIME: Maud Myers was a beautiful young woman shopping for a house in turn-of-the-century Los Angeles. William Kafitz was an established real estate developer, reeling from the tragic recent deaths of his wife (natural causes) and two sons (murder-suicide). Maud and William found love, and perhaps brief happiness, together. But the much younger bride had a wandering eye, which eventually pushed William to his breaking point. She shot him – he lived – filed for divorce – and changed his will. And that was just the beginning of the most outrageous revenge plot Los Angeles had ever seen. With one devoted boyfriend, a dangerous little black book, a fascination with explosives and a long list of enemies, Maud set out to avenge the loss of the fortune she believed she’d earned the hard way. And as the detectives working the case would discover, catching the criminals might be more dangerous for the health of the city’s civic life than leaving them on the loose. You won’t want to miss this time travel trip on the dark side of Los Angeles history, featuring the original She-Devil, the beguiling Miss Maud. Included in your ticket purchase is a copy of Mike Digby’s new book about the case, A Bombing in the Wilshire-Pico District: The True Story of a 20th Century She-Devil and Her Plot to Murder, Terrorize and Steal a Real Estate Empire in 1919 Los Angeles. Please note that this is a Special Event and no discounts apply on this tour. ABOUT OUR GUEST HOST: After serving seven years in the United States Army, Mike Digby joined the Los Angeles County Sheriff’s Department where he served proudly for more than 34 years. For the last seventeen years, he was assigned as a Detective Bomb Technician in the Arson/Bomb Squad where his duties included rendering safe and disassembling improvised explosive devices, examining and disposing of military ordnance and conducting post-blast investigations. A self-proclaimed “bomb nerd” and decorated detective, Mike has spent years studying the motives of bombers, their methods of attack and the bombs that they built. He has served as technical advisor on BBC and Discovery Channel programs. 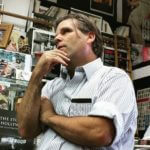 In December 2016, Mike published The Bombs, Bombers and Bombings of Los Angeles, a book which documents several dozen bombing events that took place in the Los Angeles area over the past hundred years.